The authors first novel, The Woman Who Didnt charts an unconsummated love affair on a boat between an Indian officer and an unhappily married woman. Aubrey Beardsley designed the books cover. 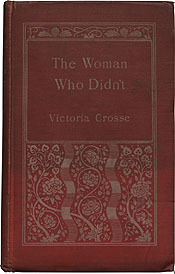 Victoria Crosse [pseud. of Vivian Cory]. The Woman Who Didnt. London: John Lane, 1895.